Things in Lafayette Hall have grown quite a bit since last semester. With the expansion over the summer, some offices and classrooms have found a new home. One of the relocations is the Financial Aid office. 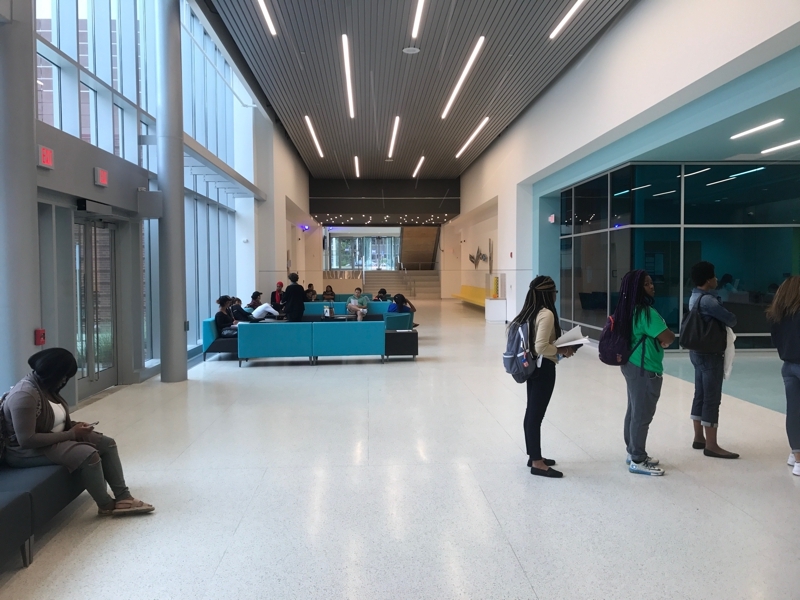 Instead of the dark hallway leading to a small cramped office in a corner, the office is now in a well lit and vibrant space where students can feel welcomed. The new and improved Financial Aid Office. Photo by Matthew Elliott. The clear blue glass that now holds the Financial Aid and Admissions office is a bright standout in the new building. Terry Walden, Assistant Director of Admissions, says this permanent move’s purpose was to “provide services to new and continuing students that keeps them in one general area not bouncing them out to different areas of the campus.” This way students are able to use school resources with the comfort of knowing everything is in one area. Dean Adande, who is studying Sociology, found this helpful. “I’ve already spent some time there. It’s nice that everything you need to get started is there,” he said. This change of space has been well received by students compared to how things were last semester. “It was too crowded. Before I used to wait until no one was in there because it was so crowded and not enough space,” Horoja Bojang, a student studying Accounting and Finance, says. However, now there is a large waiting room where students can comfortably sit and relax before they go in for their meetings. ”I think it’s nicer, newer, and more accessible than it was before,” Raul Jimenez, a General Studies major, says. If you’re worried about finding it, just relax. There are signs at the old location and around Lafayette Hall that will help you to get there. So for all the students past or present who are currently using financial aid, know that this new location was made to make things easier for you, so make sure you pay a visit and check it out. Chanelle Mattis, Matthew Elliott, and Cameron Collier co-reported and co-authored this story.